On Thursday, an early season winter storm was making its way across the Northeast. Mixed precipitation and heavy snow were expected, with forecasts indicating the greatest snow totals topping out around 12 inches for the 2-day period (Thursday-Friday). How does that compare to the greatest 2-day snowfalls on record for November? Those amounts range anywhere from 4.3 inches at Kennedy Airport, NY, up to 30.7 inches in Buffalo, NY, for the major climate sites. Greatest 2-day snowfall for November at the 35 major climate sites. About a third of the major climate sites typically see their first inch of snow in November. However, for some sites this storm will likely bring the first inch of snow a little early. November is not typically a very snowy month for much of the Northeast, so the storm could also push monthly snow totals above normal for some areas. Average date of the first inch of snow at some of the major climate sites. 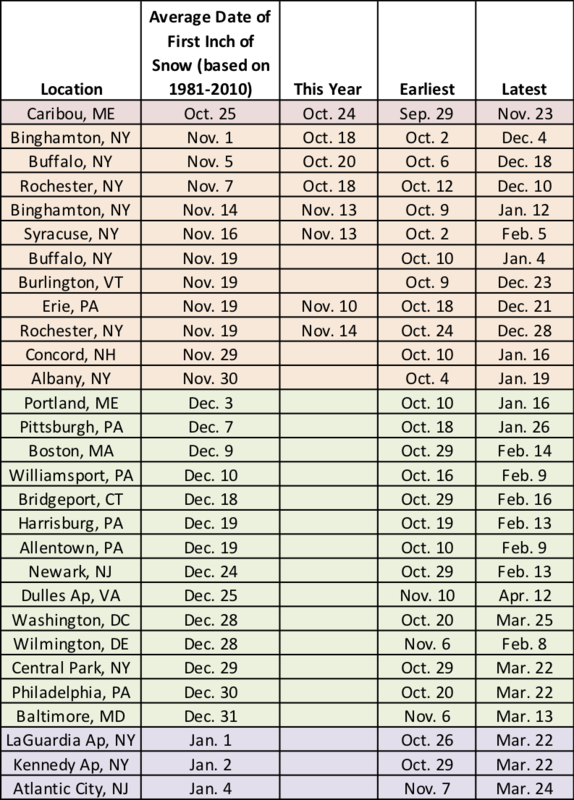 Normal November snowfall at the 35 major climate sites. In addition to possibly being snowier than normal, November-to-date has generally been wetter than normal. 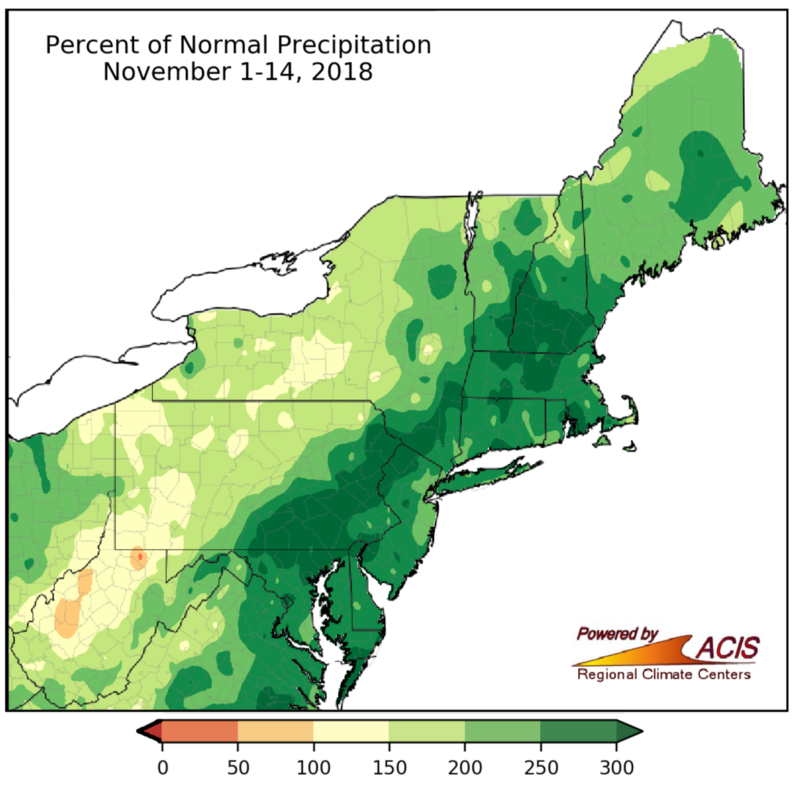 Precipitation during the first 14 days of the month ranged from near normal to more than 300% normal, with the wettest spots in an area from northern Maryland northeast into Vermont and southern New Hampshire. The precipitation eased drought and much of the abnormal dryness in the region. Average temperatures so far have generally been near to below normal for a large portion of the region. November 1-14 precipitation was above normal for almost the entire Northeast. 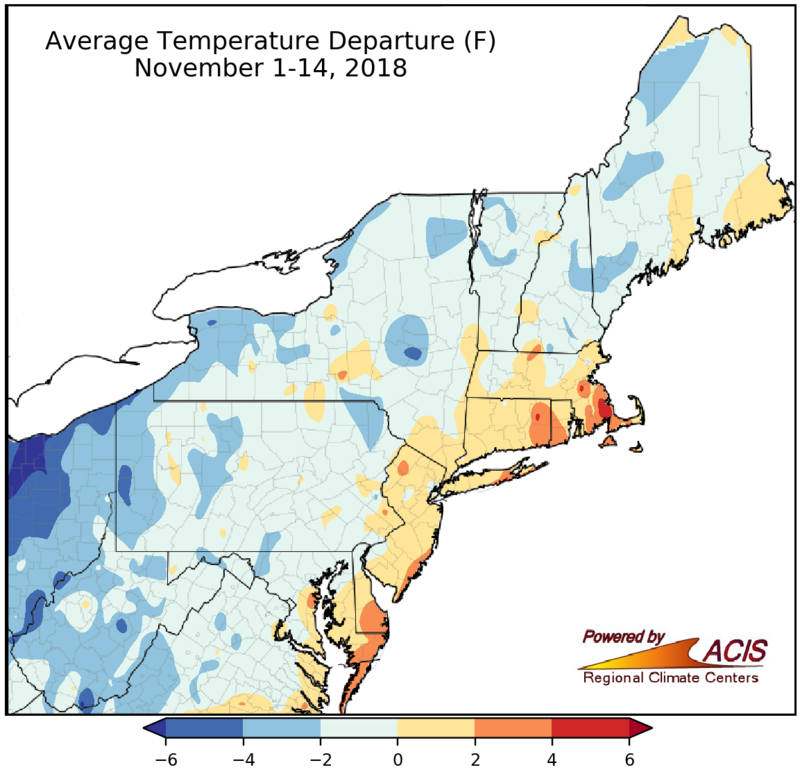 November 1-14 temperatures generally ranged from 4°F below normal to 4°F above normal.